How Do We Know if a Worksite is Safe for a Pregnant Worker? As the workforce diversifies and women enter job fields traditionally filled by men, the potential for occupational exposures to chemical and nonchemical hazards during pregnancy has increased. Nearly three-fourths of women aged 25–44 years, a major period of childbearing years, work outside the home. Most women continue to work during their pregnancy even late into the third trimester. 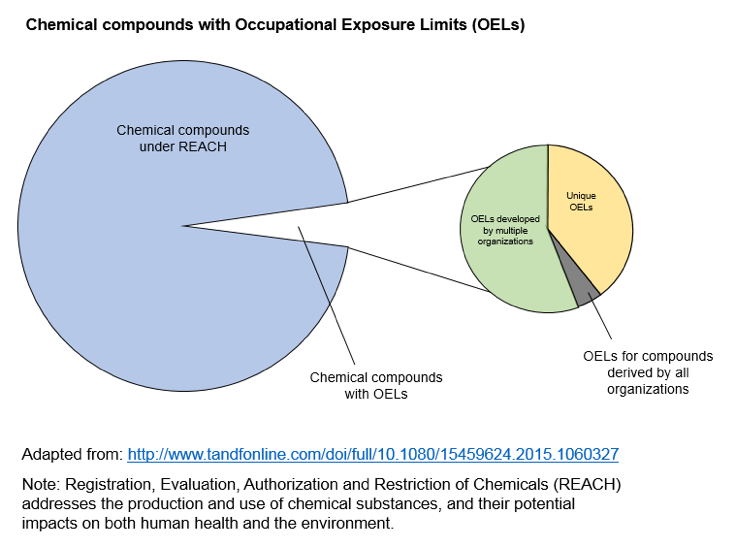 Occupational exposure limits (OELs) are values recommended by scientific authori-ties and enforced by legislation as an upper limit to the concentration of a hazardous substance in the air of a workplace. These limits are essentially risk management decisions based upon assessment of the inherent hazards of an agent, the level of exposure that can be harmful, and selection of an exposure threshold deemed protective for most individuals. OELs often predate the diverse workforce present today and may not have been set with consideration of health concerns specific to the changes in a woman’s health when she is pregnant or for the health of the developing fetus. Not only may the OEL not be adequate during pregnancy, but many chemicals do not have OELs. The lack of a limit is not surprising, given that approximately 15,000 new chemicals are registered in the Chemical Abstract Services (CAS) each day. Where OELs do exist, various organizations may create different values, making selection of the appropriate exposure threshold even more complex. Workplace health scientists may need to use information on hazards and exposure to develop guidance for potential exposures during pregnancy. The essential goal of risk management in this case is to create and maintain a workplace safe for a pregnant worker and her developing fetus. A workplace reproductive health evaluation, communicated clearly to an employee, can enable her to make informed deci-sions in partnership with her personal health care provider. To do so, the evaluation needs to consider the physiological changes during pregnancy that may impact job safety, hazards pre-sent in her responsibilities, and compare actual to harmful exposure levels. A woman’s body undergoes significant changes during pregnancy, and these changes can im-pact the potential effects of chemical agents. Increased breathing rate can amplify the absorp-tion of inhaled chemicals, while increased blood volume, altered metabolism, and decreased transport through the gut can influence toxicokinetics after absorption. How a substance is han-dled by the body is important to understand, as peak concentration in maternal blood is some-times a more important parameter than averaged exposure for developmental toxicity. Often, exposure monitoring is based upon concentrations averaged over a full work day to standardize a time-weighted-average (TWA) OEL. Several physiological changes during pregnancy, and their potential impacts, are shown in Table 1. A variety of non-chemical hazards that may adversely affect the pregnant worker or her fetus can be present in the workplace, including physical, biological, ergonomic, and psychological stressors. Many of the physical stressors are also stressful to non-pregnant employees, but the pregnant employee may have greater sensitivity and/or less tolerance. While more research is needed in many areas, studies suggest that exposures to radiation (EU limit of 100 mRem), in-fectious agents (e.g., toxoplasma, Zika, rubella), heavy lifting, shift work, noise (> 85 dB), heat, and stressful environments can potentially have a harmful effect on growth and development of the conceptus. Data about a chemical’s potential to produce reproductive or developmental harm may be availa-ble through online databases, call-in centers, and safety data sheets (SDSs), which identify haz-ardous ingredients in a product. SDS information is limited, though, in that a chemical will not be classified for these effects if it has not been tested. Manufacturers may also arrive at different interpretations for classification, even when their assessments are based upon the same data. The SDS is required to have contact information for the manufacturer, so questions and addi-tional information can be obtained. Most test data are derived from animal studies. Exposure in animal studies often occurs by oral administration, usually not the route of exposure to workplace chemicals, which is predominantly by inhalation or skin contact. The study can identify an exposure that does not harm develop-ment, the No Adverse Effect Level (NOAEL) and/or an estimated threshold exposure level at which harm could be detected, often the benchmark dose (BMD). The NOAEL or BMD can be compared to the estimated actual exposure level or the existing OEL. Many chemicals do not have data, or have very limited data. In these situations, comparisons to structurally similar chemicals or to chemicals with similar metabolic pathways may help to reach an educated opinion. Assessment of the chemical’s physical-chemical properties can be of used to estimate the likelihood of being absorbed and reaching the developing fetus if the mother is exposed. Examples of occupations and potentially harmful non-chemical and chemical agents are shown in Table 2. These provide an example of what a worksite survey may uncover. Exposure does not necessarily mean harmful. Occupational exposure assessments are typically performed by industrial hygienists in collabo-ration with other health and safety professionals. 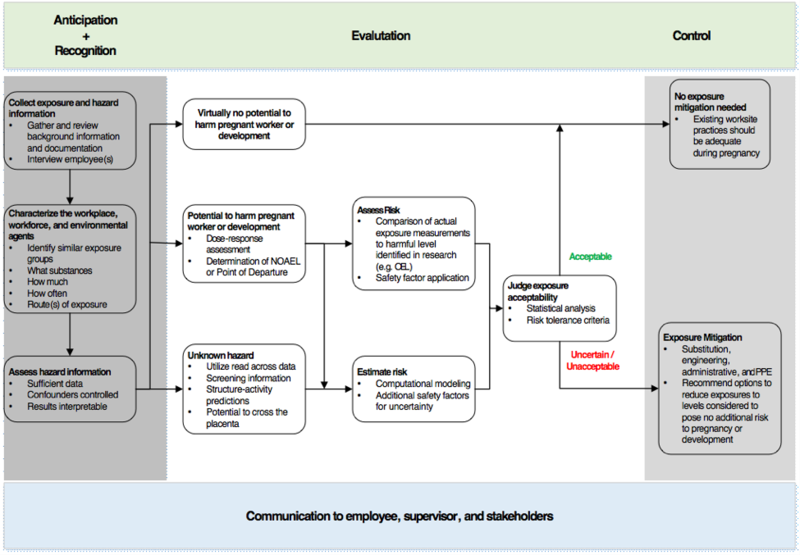 Exposure assessments follow a basic frame-work that includes characterizing the workplace, workforce, and environmental agents including chemicals, establishing similar exposure groups, and developing a monitoring plan to evaluate exposures. Peak concentration in maternal blood may be a more important parameter than av-eraged exposure for developmental toxicity. Route of exposure (e.g., skin, inhalation, ingestion, injection). If a potential source of exposure is identified and there is evidence that the exposure could be harmful, a monitoring plan is developed to prioritize and guide the collection of personal and/or area samples in order to measure actual worker exposure. If measurements cannot be collect-ed directly through personal/area monitoring or biomarkers, indirect methods such as mathemat-ical models and questionnaires may be useful to estimate potential exposure. Non-occupational exposures such as diet, overall health, and lifestyle may impact susceptibility. A risk assessment compares the dose-response curve for harmful effects against the actual exposure to derive an estimated likelihood of potential harm. The process includes, if needed, extrapolation between routes of exposure, e.g. oral to inhalation. Risk assessment also incorpo-rates safety factors to account for variability in human responses and interspecies differences. Historically, these safety factors have been 10x each for intra-individual (human) variability and interspecies (animal to human) extrapolation, but the use of non-default values based upon in-formation such as toxicokinetics can refine the process. For example, US EPA reported a max-imum factor difference of 1.5 between the 50th and 95th percentiles in pregnant women for internal dose metrics for four different volatile organic chemicals. Dermal absorption is generally greater in rats and rabbits than in humans; absorption of the pesticide lindane, for example, was roughly three-fold greater in rats than in humans (in vivo, both species). Future developments of OELs may be refined by better understanding the mechanisms of toxicity, induced biological signals, and integration of genetic factors. Substituted agents or equipment - It may be possible to substitute a risky chemical with one that poses less risk. A physical hazard may be mitigated by replacing the current task per-formance, such as lifting heavy containers, with a less stressful option such as use of a hand truck. Engineering controls - Exposures may be reduced through use of equipment such as a fume hood or ventilation. Administrative controls - Modification of the job, work procedure, or work site housekeeping may reduce exposure. Personal protective equipment - Protective equipment such as respirators and gloves reduce the likelihood of absorption of a harmful chemical. Finally, it is essential that the basis of a risk assessment be communicated to affected workers, supervisors, and other personnel as part of the overall risk management program so that actions can be prioritized and sustained and exposure potential regularly reevaluated to account for changes in processes, agents, hazard interpretation, or equipment in the workplace. Heidemann BH, McClure JH (2003) Changes in maternal physiology during pregnancy. British Journal of Anaesthesia 3(3): 65-68. Wise RA, Polito AJ, Krishnan V (2006). Respiratory physiologic changes in pregnancy. Immunology and Allergy Clinics of North America 26: 1-12.